Estás navegando en la categoría 2010 DYNATECH-ALPAMAYO . Today we got to Base Camp, a little tired; the journey here was very long. On the way we met Igor, a Basque who intends to travel around Peru for three months; but for now he has the same goal as us, this is the second time he is trying to reach it. He arrived at Base Camp with the intention of joining another roped team. We gave him the opportunity to join us, we think that being a double roped team increases our chances of success; this way we all benefit from it. Tomorrow we will climb towards IC; we must surpass a cumulated one thousand two hundred meters incline. We will see the most beautiful mountain in the world from up close; we will look at its face and caress its slopes. We hope the Alpamayo welcomes us with its best clothes and our dream comes true. Our bodies are ready once again to face new slopes and long days. We are slowly getting used to the fact that we are in the final stage of the expedition. We are aware that all the efforts we have made up until now were in order to be ready and able to face our great goal more competently. Tomorrow we are setting off to our mountain’s Base Camp. It is a long twenty-two kilometre journey which we think we will complete in approximately eight hours; the following day we will set off to the IC, where we’ll spend the night and we will wait for the best day to try to reach the top. It will all depend on whether anything has gone wrong, the weather is good and we have the strength to continue. In principle, we can’t send news out from Base Camp, if we find a way we will keep you informed. It seems that we will not be able to send reports for a few days; as soon as we are able to, we’ll keep you up to date. Your support has always been important but we are now at the critical point of this adventure and we need to feel you are close. 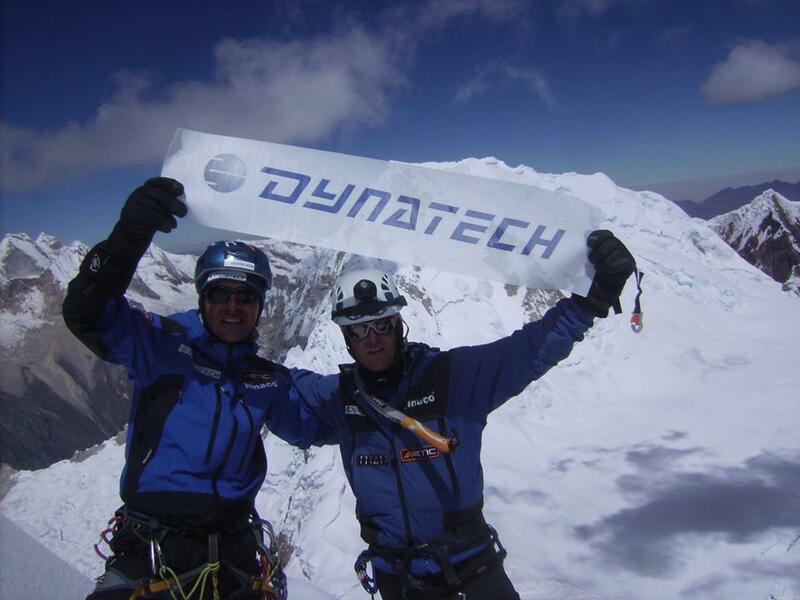 We thank Dynatech for its help, our families for their understanding and all of you for following our progress. Today we had the break we deserved, after all our efforts over the past few days. We are aware that this expedition is not over yet. Therefore this break is only a breather, an interruption in the project. We spent the day reorganising equipment and planning our tackle on the Alpamayo, our Ithaca, our dream, our aim. We tried to find last minute information. Apparently, the mountain’s conditions are good. After the accident, calm has settled, that’s the way the mountain is. Climbers hold themselves back when news is not good; an easily understandable human reaction. But the mountain is still there, forever serene, forever superior, forever powerful, no event can perturb it. However, today we met a special guy, one of those who understand the mountain and behave like it. 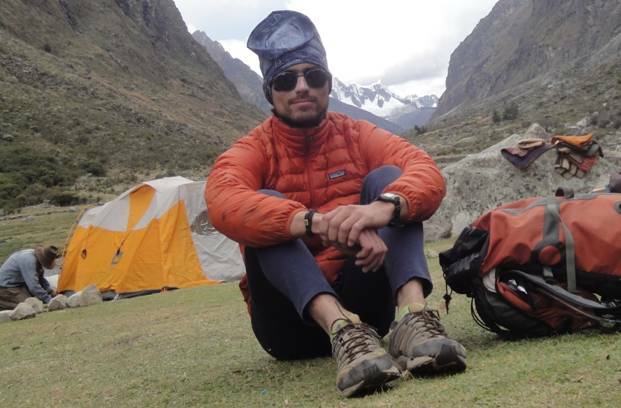 Manuel Moya, “loco Moya” for friends, a Chilean, engineering student, with a spotless mountaineering profile, not only for his sports curriculum, but also for his serenity, for his way of facing slopes. He reached the Alpamayo IC one day after the accident; the rescue operation had already started so he couldn’t do anything. His intentions didn’t change, his analysis was clear: he was facing a serene mountain, unaffected by events. Loco Moya used the Alpamayo’s weapons and was cool and calm when facing its slopes, taking careful steps, sparing his efforts. He went past the Argentinean’s body but he focused on the way to the top. 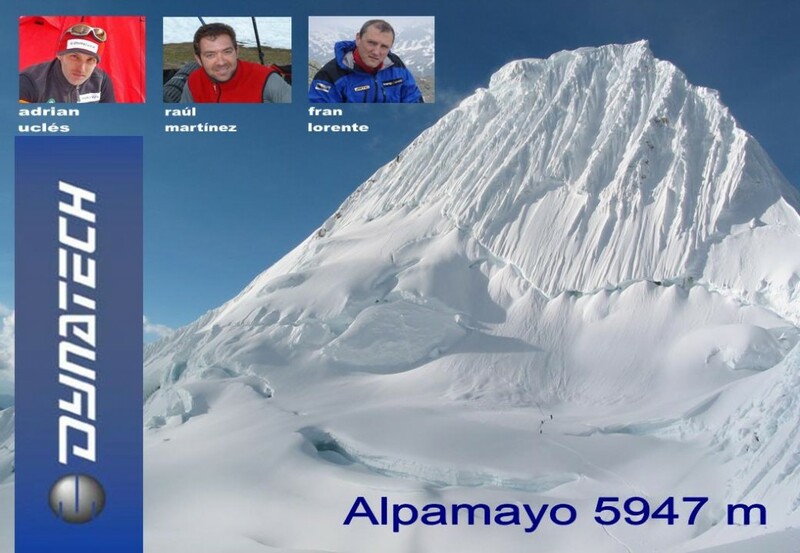 Nineteen hours after starting his ascent, at nine pm they reached the top of the Alpamayo, only his roped team was able to face the Direct French route. This is the way things are, only those able to face up to the challenge albeit circumstances deserve to reach their goal; with perseverance, determination and without ever losing faith. Yesterday we arrived at Base Camp located at 4680 m; this Base is a spectacular place as the Huandoys, Chopicalqui and Chacraraju cirque can be seen from it, as well as the Pisco itself. The Pisco stands out from all of them. 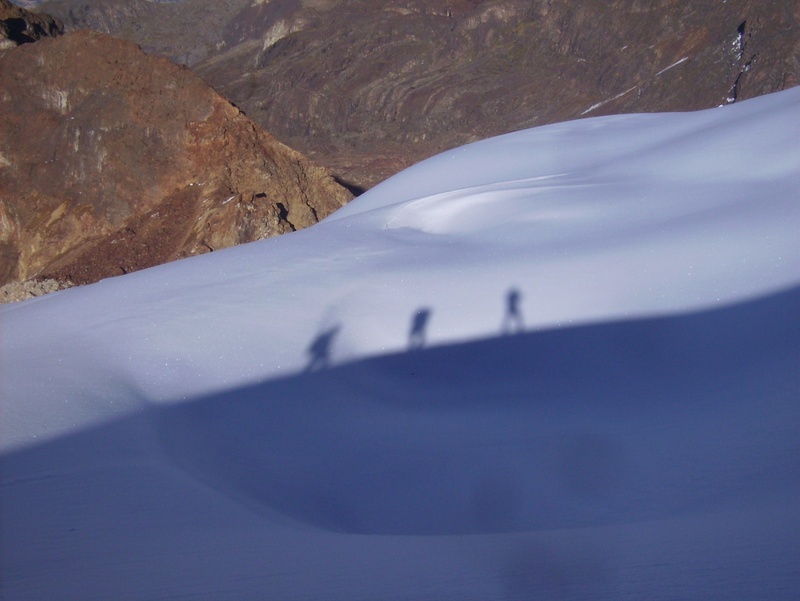 The Huandoys and the Pisco are the peaks that some expeditions determine as their main goal. Last night we set off to the top at 2 AM, being aware that we may fail as this is a very demanding mountain. At 9 AM, we reached the Pisco summit, finding ourselves on one of the most prestigious summits in Peru. The view from it is amazing; even remote mountains can be seen from the top; today, we saw the Alpamayo for the first time; it was at a distance but its narrow passes and its Bergschrund. The Pisco’s neighbour is the Chacraraju. The last accident involving expert Spanish climbers occurred on this mountain. From the top, we saw how difficult the fateful face really is. Now we are resting again; we have been active for three hours and a half and our legs are really painful. We want to be cautious in our reports; we have set off twice to acclimatise and we have made it to the top both times; you might get the feeling that this is easy: no way. We’ve been very lucky with the weather, we have thoroughly planned the ascent and, most importantly, we have been working as a great team. Keeping our commitment in mind, we want to do our best and this can only be achieved this way. We mention one of the comments on the Dynatech blog, to provide some information. Hi…excuse me…I’m writing because I’m really worried…I see that you keep your blog updated and I’d like to know whether you have some information about the mountaineer who had an accident on the Alpamayo. Some of my friends are over there and I can’t locate them…I’d like to know if there is any news about the person who fell…thanks a lot. From our location in the Andes, the news comes from third parties, therefore it is not very reliable. 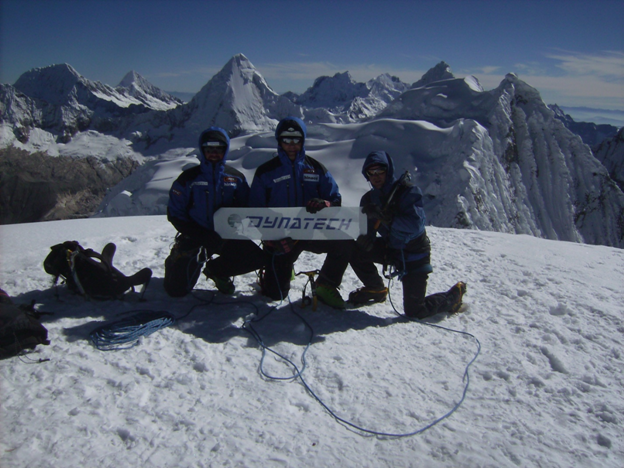 We heard at Casa Zarela that an Argentinean mountaineer was climbing the French Direct route to the Alpamayo; he was going to climb with his partner but, in Huaraz, they found out that she was three months’ pregnant and preferred to remain at Base Camp, he decided to climb on his own. On the fifth pitch, he plunged into the void dragging with him a two-Austrian roped team. The Argentinean died, one of the two Austrians has a serious spine injury and we haven’t heard anything about the other one. 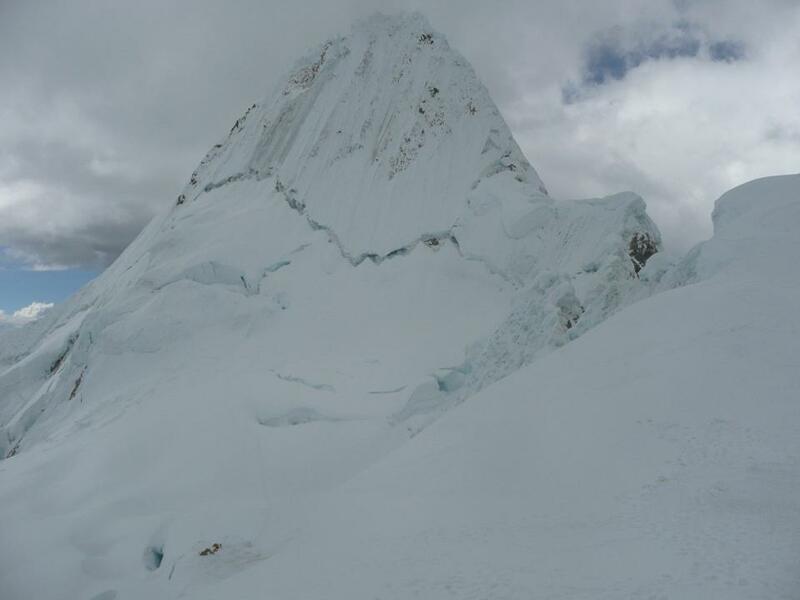 As for our intentions, we aim to go to the Pisco area, 5735 m, in order to continue the long acclimatisation process; to do this, we must reach the Base Camp, located at 4700 m, today, sleep and set off to the Pisco on the following day. We’ve been talking to some Italian people, who recently descended, and the conditions on this mountain seem to be very good; we expect to find it in these same conditions. We are now ready to face new slopes and suffer while climbing them with the only purpose of reaching our goal. The day before setting off to Peru, we said our goodbyes to Francisco Mateo (Dynatech-elevation General Manager); we were talking about the reason for his special interest in climbing and its consequent sponsorship. He told us that companies should always continue with their projects, even during difficult times, with enthusiasm and determination; and he perceived these values in mountaineering, values which are sometimes set aside in other fields. It is at that moment that Francisco convinced me; following today’s performance, I must admit that I understand his point of view to a greater extent. Yesterday we set off to the Vallunaruju area to continue our acclimatisation process. We chose this area due to its accessibility and, above all, its noticeable difference in height. Our aim was no other than to gain height in order to be better prepared for future mountains. We arrived at BC (4300 m) to sleep at this height and get used to it. In accordance with our adaptation plan, we got up early at 2 AM to walk at night. We left Base Camp at 3 AM and started climbing towards the IC, also known as Morrena Camp (4900 m); once we arrived, we felt strong enough to go a bit further and we reached the Vallunaraju summit at 5686 m.
The three of us roped up, but 300 m from the top, my cold started to take its toll. Adrián and Raúl continued to the top. Once I had rested half an hour, I felt refreshed and decided to catch up with my partners. They were coming down while I was only thirty minutes away from the top. My mind was set to make it to the top. Raúl warned me of a risky pass and finally decided to come with me, reaching the top twice in the same day. He was very tired but our mutual affection was stronger than the tiredness in his legs and he decided to accompany me to share this moment; the summit moment will be ours forever. Adrián was waiting for us in the pass paying attention to our movements and keeping our backpacks. We have been working high up for twelve long hours and we have given it everything we’ve got, getting up early and therefore resting little. We are now exhausted and we must recover quickly as this isn’t over yet. This performance confirms Francisco Mateo’s approach: this would have been impossible without enthusiasm and determination.